Thank You For Your Purchase of AutoPlay Ninja! simply by following a set of proven and easy steps! Thank you for picking up AutoPlay Ninja! Now we are making one more offer available to you right now! We all know that yoou can have the best video technology working for you, but if you do not have traffic it all is a waste. It happens when you’re packing for vacation. It happens when you’re shopping at the grocery store. And if you’re like most business owners, it happens a LOT when you’re setting up your traffic strategy with both paid and free advertising methods. You’ll go from being overwhelmed to overjoyed once you see what these 20 checklists can do for you. I’ve taken an entire multi-volume encyclopedia set of traffic-generation information and digested it down to the bare minimum of what you need to know to get great results. as sort of mini-blueprints for growing my own traffic! I’ve created and assembled in this amazing package! 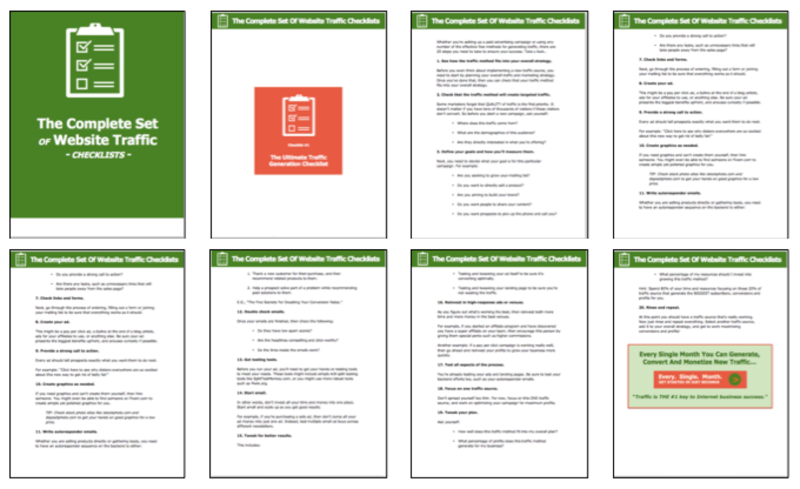 traffic-building content in Traffic Counts Checklists! Whether you’re setting up a paid advertising campaign or using any number of the effective free methods for generating traffic, there are 20 steps you need to take to ensure your success. This checklist helps you make sure your traffic strategy is bound for success! Getting traffic to your landing pages is half the battle. The second half is to turn those browsers into buyers. This is the checklist that will kick those browsers off the fence and turn them into subscribers and customers! A lot of marketers get so caught up in tracking their traffic stats that they forget to make the most of that traffic. Tell you what, traffic is worthless if your visitors aren’t buying what you’re selling, joining your list, or taking some other important action. So how do you make the most of your traffic and monetize it? First off, make sure you are indeed bringing targeted traffic to your site. And secondly, use this checklist to turn that traffic into money in the bank! If you’re just getting started with your traffic strategy and looking to get your first 1000 visitors, then this is the checklist for you. You’ll get the entire process broken down into an easy step-by-step format. You’ll probably have your first 1000 visitors even before you’ve implemented on the steps on this checklist! It’s this: take consistent action every week to generate traffic. Pretty simple, right? And yet most marketers have no idea where to start or what to do each day. That’s where this checklist comes in. You’ll get a day-by-day checklist of what you need to do to bring traffic in using affiliate marketing, paid advertising, guest blogging, social media marketing, blogging and email marketing. It’s easier than you think when you see each day laid out in an easy-to-use checklist! Are you looking for the best ways and steps to get traffic to your blog? Then look no further than this checklist. You’ll get 10 big ideas and plenty of steps and tips to implement these profitable ideas! Have you ever looked at a product on a site like Amazon, and the next thing you know you’re seeing ads for that product on sites like Facebook, news sites, and seemingly everywhere else? That’s called retargeting, and it’s a great way to bring a visitor back to your site to close the sale (especially if they didn’t buy the first time). You can also recycle your internal traffic to other parts of your site, such as sending a newsletter subscriber to another lead page in order to further segment your list. You can also recycle your traffic-generation methods to create new traffic, such as when you take a blog post and re-post it on social media. Together, these three methods work well to save time, generate new traffic, and close more sales. So how do you set it all up? By using this checklist! Have you ever seen those huge product launches that get everyone buzzing and buying? Those launches don’t happen by accident. They require quite a bit of planning, and two weeks of building anticipation, building buzz, and other promotions to make it happen. Now you too can have a successful product launch by using this 15-day checklist! When it comes to traffic and conversions, your sales funnel is your best friend and marketing tool. Your sales funnel is where you capture your traffic onto a mailing list, present them with a low-cost tripwire product to turn them into a customer, and then promote related offers. How do you set it all up? By using this profit-making checklist! One of the keys to success with paid advertising is to find and choose high-quality niche sites on which to advertise. 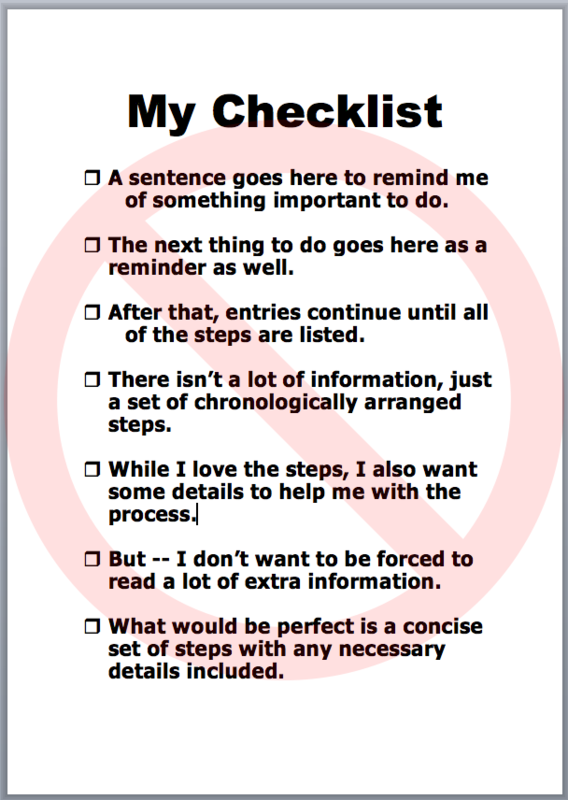 And the good news is that this checklist will walk you through all the necessary steps! Before you can even think of placing an advertisement, you need to define your goal. And then you need to design your ad campaign around that goal. This checklist will help you do exactly that for five of the most important types of ad campaigns that you’re likely to run! If you’ve never run a Facebook ad campaign before, then you’re in for a treat. That’s because Facebook has a powerful platform that lets you really narrow in on your audience demographics. And to maximize your success, you’ll want to use this checklist to set up your campaign! Guest blogging is a great way to bring targeted visitors to your site. But do it wrong, and you’re going to end up wasting a lot of time posting your content on sites that will drag your reputation into the mud. Don’t let that happen to you! Instead, Use this checklist to create and implement a successful, traffic-driving guest blogging strategy! One of the best ways to bring in a steady stream of warm leads who’re likely to buy what you’re selling is to start an affiliate program. This checklist will walk you through the entire process, from picking a platform to motivating affiliates to do their very best for you! Viral marketing is part art, part science. If it was all science, then every single viral campaign would take off like a prairie fire in a high wind. Still, you can up your chances of creating one of those amazing viral campaigns by using this checklist. These are the same strategies the pros use to launch viral campaigns, and now you can use them too! All social media is not created equally. Some platforms rely more heavily on pictures (such as Instagram), while others encourage you to post short posts (like Twitter). That’s why you need to think about your business model, do some research to see where your target market hangs out, and then focus on the social media platforms that best meet your needs. The good news is that these steps are a whole lot easier than you think – and all you have to do is put this checklist to work for you! Just because someone is leaving your site doesn’t mean that they have no interest in your content and products. On the contrary, they may just not have enough time to go through your site right now. Or maybe they didn’t see a particular offer that intrigued them enough to hit the buy button… this time. That’s why it’s so important for you to get them on your mailing list before they leave your site! That way, you can follow up with them again and again over time to close the sale. How do you do it? This checklist will walk you through the process of creating an irresistible offer to capture exiting traffic onto your mailing list before they go! A live webinar is a great way to attract leads into your sales funnel. Even better, you’ll have the recordings/replay to offer as another lead magnet to future prospects. So how do you set up a free webinar that not only attracts leads but helps you generate sales on the backend? By using this step-by-step checklist! Have you ever looked at your traffic logs and noticed that people are finding your site by searching for niche-relevant words in Google and other search engines? Sometimes it’s a happy accident. And in other cases, you can make a point of optimizing your web pages for the search engines. This checklist shows you how to start getting more traffic from the search engines! Avoid all the traffic pitfalls and mistakes that plague most online marketers! Grow your traffic, increase responses, and maximize profits! Make getting traffic faster and easier than ever before! Plus once these strategies produce just ONE or two extra sales for you, you’ll have recouped your entire investment. You can do that incredibly fast, which makes this upsell offer a great deal! Act now and you can take advantage of the special introductory sale pricing of just $37 for everything you see on this page! That’s right, with your savings you pay just $1.35 per checklist! No Thanks, I Will Pass On These Traffic Checklists! I Have Enough Traffic! P.S. Have you ever wondered what the six-figure marketers do to get traffic that you don’t do? You’ll find out inside these checklists! Now you too can put the most profitable traffic and conversion strategies to work for you starting today!